How do you stay off your phone? Correction: How can you stay off your Phone? That may sound rhetorical but we are serious and people have become addicted to their smartphone. Look at our lives from the moment we wake up and go to bed, we have our Phone in our hands at most of the times. Now they’ve got waterproof Phones and people are taking them to showers now. But why do we have this habit of checking Phones every other minute? 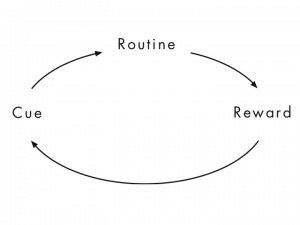 According to Charles Duhigg, the author of The Power of Habit, any habit can be broken down into three parts – Cue, Routine, and Reward. 1. Cue: It is the trigger for a habit, when you’re bored or trying to do something important but can’t focus, your mind drifts to a place that is more rewarding. Phone, in this case, is just in your proximity and you just grab it for one quick look. 2. Routine: Now, that you’ve actually held your phone in your hand now, it’s just your old routine of checking apps in an order. For example, I always check for the important emails on my phone first, then I move to Instagram and browse a couple of things there and then move to Whatsapp maybe for a quick text. 3. Reward: It’s the final nail that makes a habit hard to quit. The reward is Dopamine and serotonin, every time. These are the happy chemicals that your brain releases to reward itself for doing a good job. It gives us a feeling of joy and contentment and your boredom is gone temporarily. Now, the best way to break a habit is to break the Cue, in this case, make it difficult for us to check the phone by using apps that temporary block other apps on your iPhone and Android. Android and iOS both come with a built-in Do Not Disturb Mode but it’s not practical. It only to silent the notifications and doesn’t actually prevent you from getting into apps. The apps in the list below are the apps to keep you off your phone. 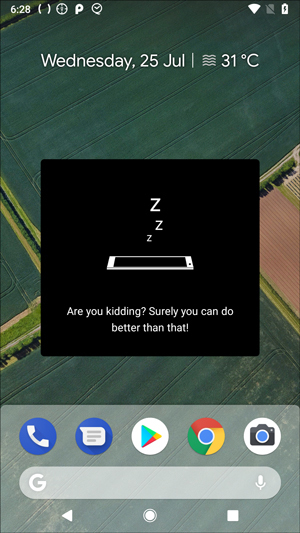 This app takes control of your smartphone and decides when it is time for a break. 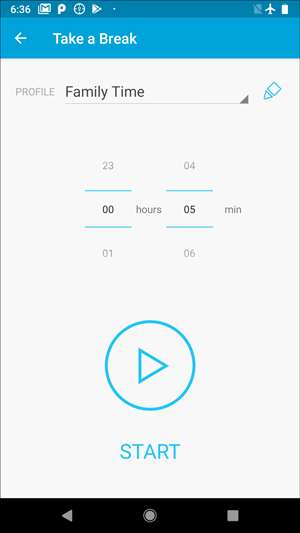 Once you start the app, you need set a time (say 20 mins) and set your phone aside for that time. Over that 20 minutes, a digital plant will grow in the app. If you feel the urge to pick up your phone, don’t. 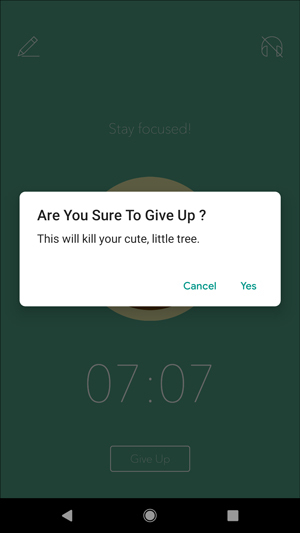 Even if you do and open an unauthorized app, Forest sends you a vibration and a notification to keep your phone down or else your digital plant would die. It’s actually effective because you at most times just need a nudge to keep from opening an app and this app gives you that. And also, who wants to see a plant die? Pros: not very intrusive. Intuitive GUI. Cons: keeps you out of the apps with notifications only. 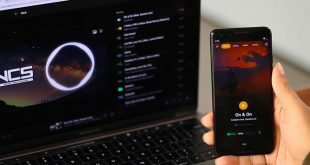 Unlike other apps that restrict you from using other apps, Siempo is a launcher app which replaces your Android’s home screen. Once you install the app, it asks for the apps that distract you the most, and then place them further away from the home screen. While all the useful apps like messages and emails will be on the first screen. Cons: No option to customize or add essential apps which can be annoying when you can’t access it. Stay Focused just like App Detox lets you filter the apps and put a lock on them to stop you from impulsively using your phone. 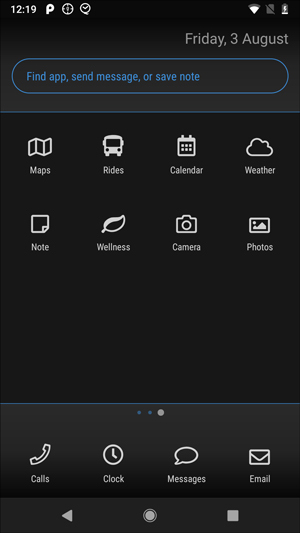 It is a little more advanced than the previous apps as it has a few additional features. For example, It has a strict mode that prevents you from uninstalling the app which essentially means that you are either going to control the impulse or not use your phone at all. It is a great feature but you should keep in mind the consequences of enabling a feature like this. You won’t access the apps that you listed here and there’s no way to reverse that until the timer runs out. 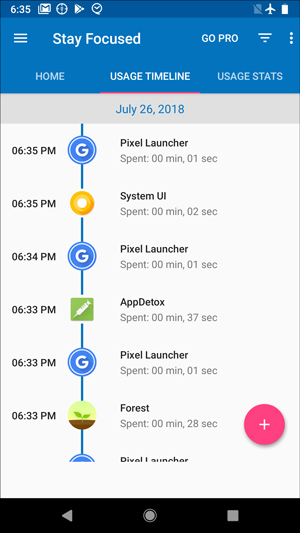 It also shows you the timeline of your daily and weekly usage and which apps you use the most. 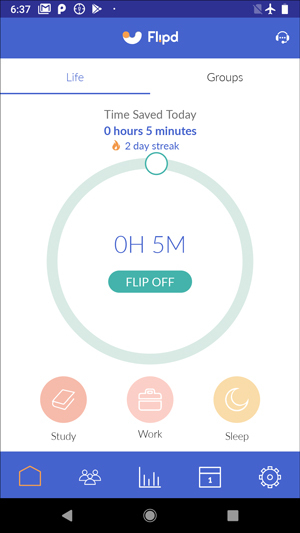 This app gives you an idea of how to curb those habits and be more productive. It also blocks any notification that you receive in that time and shows them the next day. Pros: usage stats and app usage data for better insights. Cons: the usage time is limited to 60 minutes for the free version. My grandma says the best way to quit is to go cold Turkey. Just drop that habit at once, no walking around trying to reduce the amount. The shock actually helps you in getting past the habit quicker and it actually works. 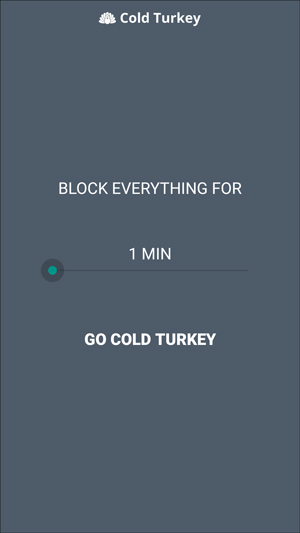 Cold Turkey has no other options, you just go into the app set a time and start the timer. It just draws its own time screen on top of every app that you try to run which is kind of irrelevant because music apps play in the background anyway. This can only be stopped when the timer runs out. 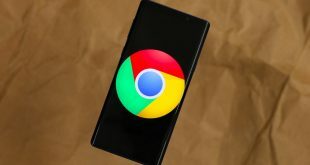 Well, there are other ways like killing it from the task manager but it keeps on override your actions and if you’re that persistent on closing an app maybe this app isn’t for you. Pros: doesn’t require any permissions. Cons: can be killed by task manager, doesn’t really blocks apps. 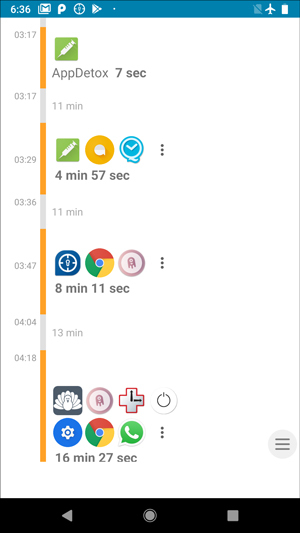 This is not an app blocking app but an analysis app that analyzes your phone usage and habits and generates an insight that shows which app takes most of your time. 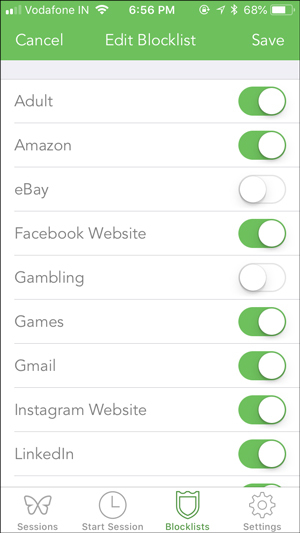 It gives you a daily, 7-day and a 30-day report on which apps are used and how frequently you pick up your phone. 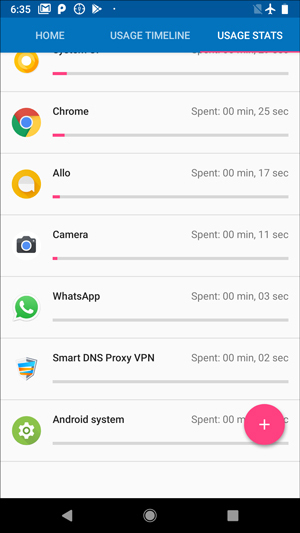 The best part is not just the apps, it tracks your website usage on Chrome and Android browser too. Due to iOS restrictions, RescueTime is only available for Android. To track your time on screen and your app usage on iPhone, use the Moment app. Pros: gives a detailed app usage history over a period of time. Cons: doesn’t keep you from using the apps. 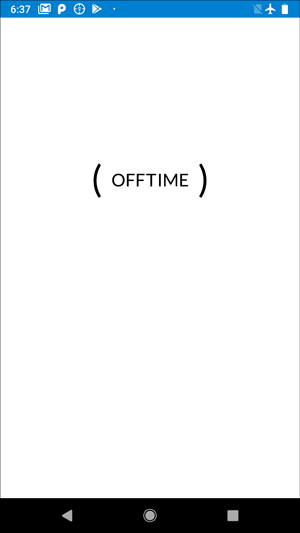 Offtime, helps you unwind and stay away from your phone. To do this you just give this app permissions and set a list to apps that you don’t want to block like Google Chrome or Skype etc. 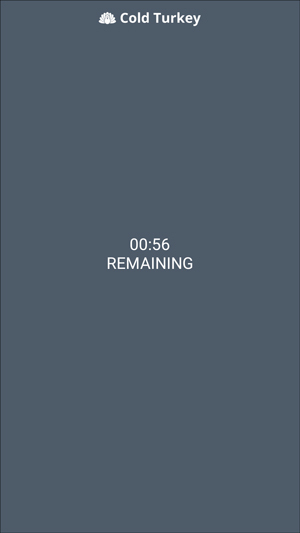 When you start this app, it takes up the screen and shows you a timer for which you can’t use your phone. 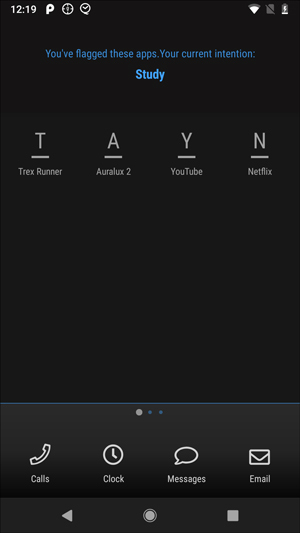 The feature that sets it apart is that the app can make itself the Admin and control every aspect. It even stops you from turning on the screen until the time runs out. You get insights into your usage and activities when you turn this feature on in the app. When you’re locked out of your phone and you try to open any app that isn’t whitelisted. You get a stern message from the app and you can’t even open the app. Pros: Robust design, no way to fool the app to get into apps. Cons: There is no option to set a profile for specific apps. 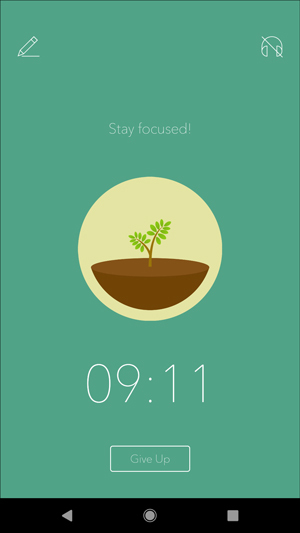 Help Me Focus is an app blocker with many advanced features. 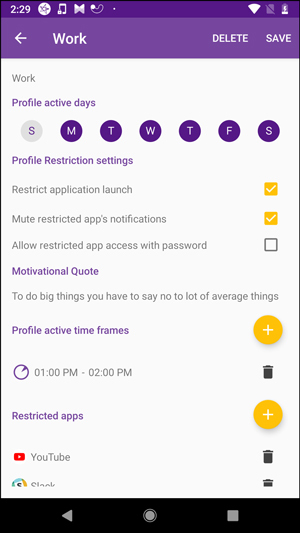 It not only lets you block apps to keep you off your phone but it can also create a profile which has extensive features. 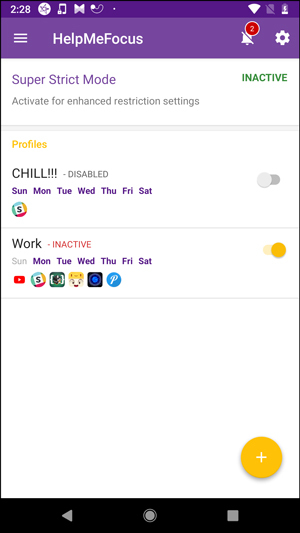 In the profile, you can select days of the week and the time slot when the app would run and block apps and notifications. The profile automatically deactivates once the time slot is over. This makes the whole process automated and you can focus on more important things. The app has an instant block button as well to permanently block apps if you so desire for that. But if you can’t resist the urge to check the notifications and try to turn the application off to check the notifications, there is an inbuilt failsafe which is known as the super strict mode, which prevents uninstallation of Help Me Focus and modification of the profile when it is active. Pros: Profile feature lets you automate the app blocking process, super strict mode keeps the profile active and makes your attempts to uninstall the app useless. Cons: You can still see the muted notifications in the app. Freedom is more of a content blocker which blocks most of the websites on Safari. However, you can block apps too in the paid version. It is available only for iOS now and has a very simple UI. You start a session by setting the time period and choosing the websites to block. You can customize or make new blocklist for your content that needs to be blocked. There is a locked mode when enabled would prevent you from stopping the sessions and making it harder for you to quit the app. Pros: best for blocking social media websites in Safari. Cons: can’t really control and stop other apps. Quitting is easier when you have a friend to join you. 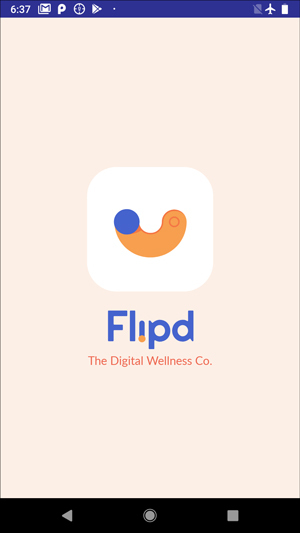 Flipd takes advantage of this and lets you create pacts with your friends to quit your phone together. You log in with your social media, look for your friends and do this activity together in a group. Or if you want to do it alone that’s is also an option with this app. It also has an option of keeping track of activities and generating insights in the paid version. Pros: you can create groups and compare your progress. Cons: can’t set a timer for more than 30 minutes in the free version. Unlike other apps, Space doesn’t believe that filtering an app won’t affect your habit because you’ll soon find an alternative habit. Like when your toys were taken away during study time, staring at the wall seemed more interesting than actually studying. Or you have a habit of compulsively turning the screen on to check if there is something a new notification (just like compulsively checking the fridge hoping, it would have something new this time). 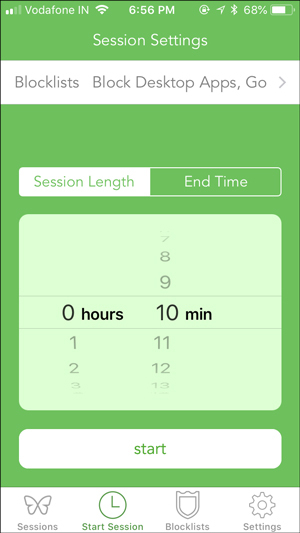 Space lets you set a time limit on the usage of the phone and the number of times you turn on the phone screen. When you set this and turn the timer on. 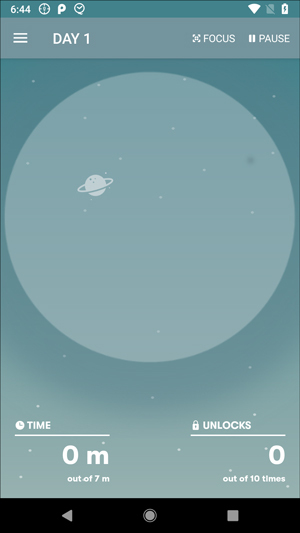 App silently counts everything in the background. 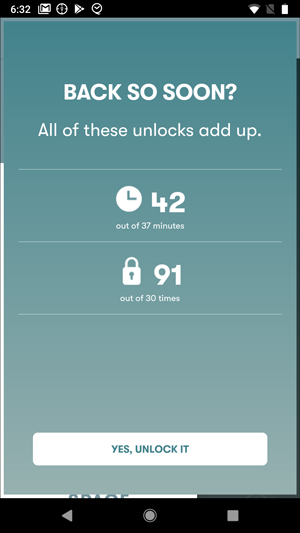 Let’s say you’ve reached to the maximum number of unlocks per day, it’ll send you a notification that you’ve run out of unlocks. You can also compare your progress up to 60 days with your friends. Pros: intuitive layout and approach. Cons: not very effective at reducing app usage time with non-intrusive notifications. 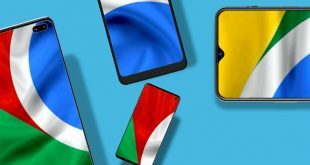 Which is the best App to Keep You Off Your Phone? We presented you with a list of apps to keep you off your Phone, the apps listed on this page help you break the habit by either suggesting you keep away from the phone with notifications and stats, others are more controlling and block your access to apps. Alternatively, you can also lock the app with a big password and save it in the password manager, every time you want to open the app, you will have to access password manager first, which is bit turn off.